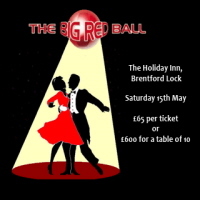 Brentford Football Club is holding its annual end of season extravaganza, The Big Red Ball at the Holiday Inn at Brentford Lock on May 15th and all the players and management will be in attendance. The Reception commences at 6pm where guests will be greeted with champagne cocktails whilst being entertained by The Barber String Quartet comprising of four talented, trained musicians who have appeared at Festival Hall, The Royal Albert Hall and Sadlers Wells. Asparagus, prawn and cantaloupe melon salad drizzled with forest fruit vinaigrette. Breast of chicken roasted with grapes, ginger and cinnamon served set on roasted vegetables and potatoes and finished with a minted red wine jus. Needless to say there are vegetarian options whilst all special dietary requirements will be satisfied. Throughout the evening highlights from the season will be relayed through specially mounted screens together with a special introduction to those in contention for the Player of the Season. The regular components that make up these special Big Red Ball nights will be in place again, such as roaming magicians, table competitions, auctions items, and raffle prizes. The main entertainment of the evening will be provided by after dinner speaker and comedian, Ian Irving, who has performed at some of the most prestigious venues around the world. He is also the 2010 Captain of The Variety Club of Great Britain golf team. Finally guests will have the opportunity to unwind and shake a leg with a Disco to complete the evening`s entertainment. Tickets are £550 + vat for a Table of Ten, or £60 + vat for individual tickets.